Jakin ID is established by successful entrepreneurial veterans of the technology industries. We offer commercial physical security and workforce management customers an IoT-first unified access control and workforce management solution supporting traditional on-premises private cloud and cloud subscription deployment models. 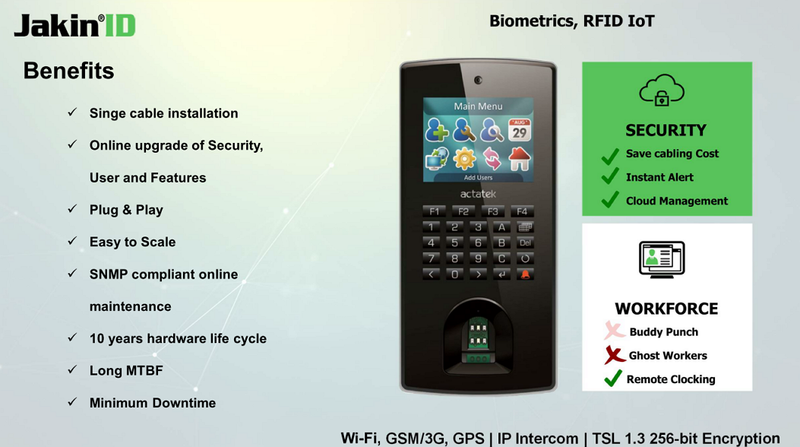 The Jakin ID IoT product is designed not just for end users to replace their time clocks and door card readers but also for the Security and IT Integrator channel. If you're looking for an easy migration path to take your customers to the cloud, private or public, while enjoying consistent lifetime value via recurring revenue, contact us. With proven products and solutions installed world wide in Fortune 500 companies, governments and other leading institutions, we are a recipient of the Frost Sullivan World Biometric Vertical Market Penetration Award. SC Magazine Awards 2006 – Best Biometric Device in the Reader Trust Awards.